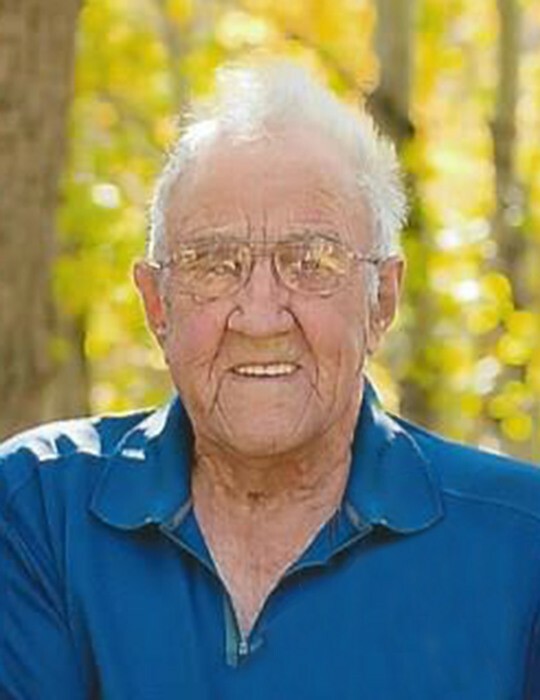 Obituary for Joseph Geiger | Binkley's Funeral Service Ltd.
Joseph Peter Geiger age 90 of Medicine Hat, Alberta, passed away peacefully Tuesday May 15, 2018 in Medicine Hat, Alberta. Funeral Service to be held Monday, May 21, 2018 at 1:00PM in the Consul Community Hall, Consul, Saskatchewan with burial in the Consul Cemetery. Pastor David Manley officiating with Binkley’s Funeral Services(M.C.) in charge of arrangements. Pallbearers are Cole Geiger, Wyatt Geiger, Tad Halladay, Jess Halladay, Raymond Broderick, James Weisgerber. Joseph was predeceased by his parents, Nicodemus and Justina, his wife of 57 years, Sharon Rose(Wagner), 4 Geiger brothers and 5 Geiger sister-in-laws, George(Minnie), Jack (Margaret, Helen), Nick (Averil), Leo, Alice, 6 sisters and 8 Geiger brothers-in-law: Jenevieve (Harry Fischer, Leo Brophy) ,Barbara, Mary(Leo Brophy),Clara(d. 3 Mo), Josephine(Sam Beeson, Ross Munroe), Wilf Boisjoli, John Duncan, Martha(Ed Gammelseter, Maurice Caron),4 Wagner Brothers-in-law and 2Wagner Sisters -in-law, Jack(Jean), Ken, Harry, Maloa Stewart(Bob). He is survived by 2 Sons, Terry(Cindy), Rick, 3 Grandchildren, Brandi Kent(Steven), Cole Geiger(Kristy), Wyatt Geiger(Jodi), 6 Great Grandchildren, Taliah, Seth, Grace Kent, Blaire, Levi, Logan Geiger, 1 brother, Philip, 1 Sister, Philomine Geiger Duncan, 1 Geiger sister in law, Mabel, 1 Wagner brother in law, and 3 Wagner Sister-in- laws, Keith(Mary), Iva Jean, Eleanor. Joseph was born September 18, 1927 on the family farm SW 3-3-28 W3rd near Govenlock, Saskatchewan. He received his education at nearby Line Coulee and Zentner Schools - in his own words, “for nearly 10 years always at the top and bottom of my grade - I was the only one in that grade!” He left home to work for a few neighbors in the ranching industry before spending a winter working for Comenco Mines in Kimberly, BC in 1947. He returned home to help on the family farm when his Dad was ailing with cancer. In 1955, he married Sharon Wagner and they lived and worked on the family farm/ranch until 1986 when they moved to Medicine Hat and built their dream home a few years later. Joe worked for the Ellis Family helping with Auction Sales for the first few years in Medicine Hat before retiring fully. In Dec 2011, he and Sharon moved to Meadowlands retirement home and after her passing in December 2012, he continued to reside there until his Jan 2018 move to Sunnyside(Haven) extended care facility for the last 5 months of his life. He served on several committees: Consul Livestock Sales (26 years as Sec-Treas), Centennial Rink, RM Council (6 Years), PFRA. Joe realized two of his lifelong dreams when he earned his private pilot’s licence in Medicine Hat in 1961 and bought a Piper Cub plane in 1963 for crop spraying and for pleasure. Before he sold it in 1970, many family, friends and neighbors received their very first airplane rides from Joe. The airplane led to two of the most enjoyable winters he remembered: hunting coyotes with his gunner, Ben Broderick. He and Sharon also took some very memorable trips with family and friends to Hawaii, the Caribbean, Northern & Southern USA including one to Hawaii in January 2014 at the age of 86. Joseph, who will be fondly remembered and lovingly missed by numerous family, friends, and neighbors for his infectious laugh & lively, joyful sense of humour, was honoured by so many who kept in touch with him to the very last days of his well-lived 90 years. Joseph Geiger, our courageous role model and a cowman, full of integrity has his image and favorite cowboy hat forever memorialized in the Bernie Brown black and white drawing named, “The Branding”.